It tells you exactly what everything on the Plumbutter does. Is there something similar out there for the CocoQuantus? I think my neighbours are going to kill me or I am going to deafen myself. There are a few mistakes in it, but there's a map by Chorus7 in the main Cocoquantus thread. Plus see the Quantussian logic thread for a link to a description of how the Quantus works. Kozepz's videos are very helpful too. There are a few where he begins from scratch, samples a triangle from the Quantus and plays it back from the Coco while modulating the speed to get some nice sounds. I have no idea what green does on the CQ2 or the black buttons. I hope I have all that info right and if anyone can add anything please do..
Can you tell me what the switch positions are on the cocos? Also, the diagram shows that the output is stereo. However I get both channels of the cocos out of a single output, I am using a spitter, is this normal? You shouldn't be getting both Cocos out on one channel.. That seems strange. I'm not sure what you mean by using a splitter though. The switches in each Coco are the Dolby switches. The left switch is the Dolby for Input, right switch is the Feedback Dolby. In the center position they don't do anything. In the up position they apply a 'noise' filtering compression, based on dolby noise reduction in tape players, basically blocking out any part of the signal below a certain threshold, to their respective input. In the bottom position they block the signal entirely at the respective input if there is a signal present at the other. So, for example, with Input and Feedback levels both up, and the Coco circulating material through it's buffer, if the Feedback's Dolby switch is in the down position, and Input Dolby is centered, you will only hear the Feedback output when there is no signal coming into the Input. I am not experiencing that. I find that the coco switches are effectively acting like mutes and recording armed. If both switches are up I can record new material into the buffer. If I lower the input switch the input signal is disabled and I can hear the loop. If I apply signal while the loop is active it doesn't seem to record new material. I am going to find this thing puzzling. It sounds like you are putting the switch in the up position then putting the switch to the down position, skipping the middle. There should be a center position which deactivates the Dolby system all together. If there isn't, there should be, unless something has drastically changed recently (I got my Coco in July). Hmm ok, I think mine is one of the newer ones with the orange envelope follower. If I just have the switches centred what should I be experiencing in terms of recording and looping? It depends what the record button is doing. If there is a red LED on, you are not recording, just circulating whatever is in the buffer. It's present when you turn the feedback pot up (pot with the upside-down F below it). At that point the Dolby switches in center position do nothing. In the up position it will be a subtle noise reduction. In the down position, turn up the input pot, and turn up the feedback pot (btw, input at around 12 o'clock is a nice level, feedback 10-11). Play rhythmic material, like a beat, into the input and have the Coco circulate whatever (record button still off - LED is on). If you put the dolby switch to the down position of the feedback, and leave the Dolby switch at center for the Input, you will only hear the recorded loop when there is no rhythmic beat. The input dolby works in the same way, just reverse. Now center the dolby switches. Press the record button, the light turns off, you should now be hearing whatever is at the input delayed based on the delay time pot. At that point switching a dolby to the down position for either the input or the feedback will do interesting things. Switch a dolby to the down position for the input, and now the buffer will only capture sound when nothing is playing from it (you will only hear the dry input signal when this is happening too). Switching a dolby for the feedback, will do the opposite, you'll only hear the recorded loop when the input is quiet. Just figured out that the black buttons are record arm/unarm. It allows for nice auditioning for overdubs. The Dolby switches, I guess I will get there eventually. I am finding when I put the feedback dolby switch down, it just mutes the loop. Yeh, I've only recently gotten to wrapping my head around incorporating them. I typically keep them in the center position. I've tried using the coco as a simple delay but the "delay time" control just speeds up the loop. The LED is off, is this normal? where do you have your feedback set? you want the red LED off.. that means you're actively recording, which is what you'd want for delay. Keep the delay time knob past 3 for the most obvious effect. Input at 12, or to taste, feedback at 9 or 10. Press the record button so the LED is on. Turn the delay time maximum CW. Turn the input knob maximum CCW. Turn the feedback knob maximum CCW. Press the record button so the LED turns off. Wait a tick, and press the record button again. The buffer should now be cleared of initial Coco-mud. Now set the speed knob to 3 or 4 or 5. Turn the input to taste, and feedback to 9 or 10. Press the record button so the LED is off. You should now be hearing your signal plus a Coco-ed delay. To lock something in the buffer, press the record button again so the LED turns on, you will now stop overwriting the buffer. I think I have a lot of it figured out now. What is the maximum sample time? I am finding it hard to punch in loops accurately. Presumably hitting the black button to trap a loop into the buffer captures the previous however many seconds of audio? I recently purchased a Cocoquantus 2 and am attempting to get my head around it. I had found a "Cocoquantus Map" on here (via this thread). I have attempted to update it or fill in the couple of blanks that were on it. All you Cocoquantus GuRu's out there... does this info look accurate? Is there anything else anyone would add? 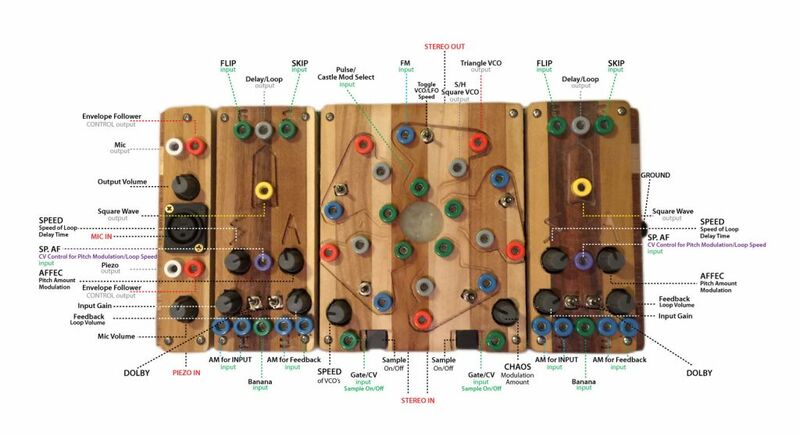 Are the Dolby switches corresponding to the knob they are closest to? And they are three way switches, which positions do what? Also the three position switches in the quantussy for each oscillator, is there a speed setting at each position? Yes, the switches correspond to the knob they are closest to as you might expect. The middle position is off, up is on, down is inverting on. In the Quantussy the middle position is audio rate, outward is low, inward is lowest. There are those that might say this spoon feeds people instead of encouraging exploration. I'm not one of those people. This is awesome! A nice iteration of the previous ones I've seen. I'll need to cross-reference this at home with some other materials but fantastic job, super clean.